When it comes to top of the line pipes, there's the Cobra Speedster, and then there's everyone else. That's because from the port to tip, Cobra stopped at nothing to create the most feature packed quality exhaust system on the market. From it's PowerPort technology that gives you 2:1 power while maintaining the great 2:2 look, to a replaceable quiet core baffle system for real sound tunability, the Speedster exhaust line redefines standards and sets new ones. And that's only the beginning. Because beyond all the performance and sound enhancements, you will also find a fit and finish that's unmatched in the industry. Chrome plated and machined billeted tips ensure an ultra clean fit, and then Cobra wraps them in full length custom heat shields with a triple-layer chrome finish that will never blue. When Cobra says they gave this pipe everything they have, they meant it. Literally. Put these on a Star Stryker and it sounds great! The overall install was not too difficult and the directions were easy to follow. Great sound, looks really good, install for the most part easy. I bought these for my 2010 stateline to replace the ugly 4-wheeler sounding stock system and wow. They were easy to install and look ad sound great. Worth every penny. Installed Cobra pipes on my 2011 Yamaha Stryker. Much better look and a lot better sound! Pipes are smaller than stock and now I have an access to the rear axle nut and was able to lower passenger foot pegs by simply flipping the stock ones over. Overall I'm very pleased with these aftermarket pipes. Much improvement from the stock! Heat shields a little tricky but still done in a couple hours. Look and sound way better than pipes on bike when I bought it. Not quiet but not loud enough for neighbors to want to choke me. Put these on 2008 VTX 1300 R. Looks good, sounds great, noticeable improvement in performance. Completely blown away by this exhaust. I did my research and was convinced that this was 100 times better than the V&H and I am extremely happy with this. It has woke up the V star! It makes it sound like a whole other bike. Received these pipes quick. The sound is exactly what I was looking for. Loud enough to be heard, but not obnoxious. Do these pipes have oxygen sensor bungs? For machines that require an oxygen sensor, these exhausts do include O2 sensor ports. How do Cobra Speedster Slashdown exhaust sound? Cobra exhausts sound as good as they look! Really, while an exhaust's sound is a rather subjective matter - what you get is a well-made exhaust that's certainly louder than stock. Most Cobra exhausts come with removable baffles, too. In the case that the pipes are not loud enough, you can simply pull the baffles to turn up the volume. Most of our customers find the included baffles to be just right and the sound to be of an exceptional tone. Will these pipes allow for mid controls on a 2011 fxdc? The 2011 FXDC came off the assembly line with mid-controls fitted as standard. So long as you have the stock controls on there, you should have no problem fitting this exhaust. If it's an aftermarket kit, let us know what you have and we'll be happy to see if we can find out if this exhaust fits your specific needs. As a general rule, Cobra exhausts are designed to fit bikes in the stock configuration, this includes the foot controls that come on the bike from the factory. Most of the time, it isn't an issue if you're putting aftermarket foot controls on your bike that reside in the same position as stock. Does the hardware come with it? Yes - all Cobra exhausts come with all required installation hardware along with easy-to-follow instructions. All you need are simple hand tools and an evening in the garage to get the job done! Do these exact pipes come with removable baffles? And are they going to fit my kawasaki vulcan 1500 classic FI? Yes, the Cobra exhaust to fit your Vulcan 1500 Classic does indeed come with removable baffles. Provided you have a 2000 thru 2008 model year Vulcan 1500 Classic with fuel injection, you should have no problems installing this exhaust on your machine. Just be sure to choose your model and year from the drop down menu to the right of the main image and we'll be sure to get the correct Cobra exhaust on its way to you. While it's not required, if you want to get the most out any new exhaust, you'd certainly want to adjust fueling as well. In this way, you're assured maximum engine performance and the best possible throttle response. The bike may run a little too lean with the exhaust alone, and this would be especially noticeable at partial throttle (cruising speeds) or when you give it a big handful. Basically, any time you change the way air gets into, or out of your bike's engine, you'd want to adjust fueling to get the best bang for your buck. In the case of the 2008 Kawasaki VN900 (Classic or Custom), as the bike is fuel-injected, Cobra recommends the Fi2000R Fuel Controller. Since it was developed by the same manufacturer as the Speedster exhaust, it comes with a set of instructions which clearly note how to get the most out of that particular setup. No, there are no manifold gaskets included with this Cobra exhaust. Provided the OEM gaskets are in good shape, you should have no problem re-using them to install this exhaust. Otherwise, we do have a variety of exhaust gaskets available from Cometic and Drag Specialties to go with this exhaust should you need a set. wil these fit with saddle bags? It really depends on what kind of saddlebags it is that you have on your bike. If your bike shipped from the factory with saddlebags, then you should have no problem installing this, or any other Cobra exhaust on your bike. If you're still unsure, or you have aftermarket saddlebags on your machine - just select your make, model and year from the Select Your Ride tool that's to the right of the main image above. Once you've done that, you'll see a photo of the Cobra exhaust installed on your motorcycle and compare the position of the saddlebags on your bike to that of the exhaust shown in the picture. That should give you a pretty good idea of whether or not this Cobra aftermarket exhaust system will fit your machine. If you're still unsure, just let us know exactly what you have by year, make and model along with the type of saddlebags that are on your bike and we'll be sure to let you know if this exhaust will fit your needs! WILL THIS FIT MY 2015 KAWASKI 900 CLASSIC LT? Yes, absolutely - this exhaust will indeed fit the 2015 Vulcan 900 Classic LT. Simply choose your make, year and model from our drop down fit guide that's immediately to the right of the main image and we'll get the correct VN900 Vulcan Cobra exhaust on its way to you, fast! DOES THE EXHAUST COMES WITH THE HEAT SHIELD?? IS THAT A SEPARATE PART? Yes, all Cobra Speedster Slashdown exhausts come with full-length, custom-designed Cobra heat shields. You don't need to purchase them separately - everything is in the box ready for installation. I ordered the Cobra Speedster Slashdown Exhaust System, i also ordered the powerpro black fuel system, i already got the powerpro black but not the pipes, do i have to instal the pipes first or can i install the powerpro first and then later on the exhaust? You can go ahead and install the PowrPro Black before the pipes arrive since, once you plug it in, the unit continuously calibrates fuel delivery while you ride. After the exhaust arrives, just open the Cobra PowrPro Black app and set it for the new exhaust once you've put it on your bike and you'll be all set. On a 2011 Stryker with no mods, all factory setup. Do I need to install a fuel controller if I'm only putting these pipes on? While you don't have to install a Yamaha Stryker fuel controller, we strongly encourage you to do so if you want to get the best bang for your buck out of the exhaust. The Yamaha Stryker's OEM ECU is limited in what changes it can make to fuel deliver in order to accommodate the new Cobra Stryker exhaust. Depending on where you ride altitude-wise and the quality of fuel available in your area, this may not be an issue. However, if you find that the bike, for example; doesn't respond to throttle input very accurately or stumbles at cruising speeds for no apparent reason, those are indications of poor fuel delivery. You would certainly need to adjust fueling if those symptoms cropped up. In the case of Cobra's exhausts, we recommend the Cobra PowrPro Black Fuel Controller. With that system, just plug it in, configure it by downloading the free Android or iOS smartphone app and you'll be assured the best possible engine performance and throttle response possible with the installation of the Cobra exhaust system. What fuel controller do you suggest for a Honda VTX 1800 with this exhaust? The best match for the Slashdown VTX1800 exhaust from Cobra would be a Cobra Fi2000R Fuel Controller. As it's developed in tandem by the same manufacturer - they're basically set up right out of the box to work with that exhaust. Adjusting it is rather simple, too - the included instructions do an excellent job of explaining what adjustments to make based upon the feedback you get from the bike after installation. In this way, you can be sure t get the most out of the engine with the new exhaust system for the VTX 1800 Honda. I'm wanting to put cobra speedster slashdown exhaust pipes on my 2010 yamaha roadstar Silverado s, can I order them without baffles or are they removable? Yes, Cobra's Slashdown exhaust for the 2010 Yamaha Road Star Silverado S does indeed come with removable baffles. While there's no option to have the exhaust shipped without the baffles installed, you can easily remove them before or after you install the exhaust on your bike. A single screw secures each baffle in place so doing a baffle R&R is a quick, simple job. Can I get them flat black or black powder coated instead of chrome finish ? Cobra's Speedster Slashdown Exhaust is available in chrome and black for most of the bikes we have listed in our fit guide. In the instance you're only able to find chrome, that's due to the fact that Cobra only builds a chrome Speedster Slashdown exhaust for your particular bike. Will this fit 2013 vstar deluxe 1300? Yes, this Cobra V-Star 1300 Speedster exhaust will fit the Deluxe version of that bike as well. 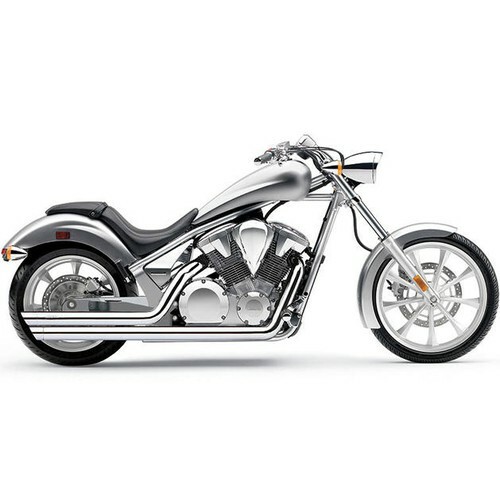 Just choose the Yamaha XVS1300CTF V-Star 1300 Deluxe Cobra Slashdown exhaust system from our fit guide and you'll get the proper parts to fit your machine, we guarantee it! I've read the other questions and answers above, I'm really wanting my 2009 vstar to be louder. That's the main objective. The stock pipe with baffles out isn't loud at all. Will this be louder by a lot or is that more of an engine / pipe combo? Also is there anything else I need or do I just install new pipes and it's ready to roll? As you can tell, I'm a newb. If you want an exhaust that's going to be louder than stock, even with the baffles removed - this will certainly be the ticket. This is due to the fact that there's also a set of catalytic convertors in the OEM exhaust that remain even if you were to just replace the mufflers themselves. By replacing the entire exhaust system, with something like the Slashdowns in question, all of this is eliminated. About the only thing we recommend that you obtain in addition to this exhaust is an Fi2000R fuel tuner since you would be changing the engine's fueling requirements. The Fi2000R comes pre-configured from Cobra to work with their full exhaust systems, so it's just a matter of putting it on and hitting the road. With that device and the new exhaust, you can expect better throttle response, more engine power and, of course, more sound! The included instructions for both, the exhaust and the fuel tuner, do an excellent job of explaining the installation technique. You could get all of the work done in one evening in the garage provided you have simple metric hand tools. so i have a 2015 yamaha v star 950 and it has the o2 sensor these pipes have the hook up? or do i need to buy a fuel proccesser? Yes, the Speedster Slashdown exhaust system comes with a provision for attaching the OEM V-Star 950's oxygen sensors. There's no need to make any modifications in that regard. As far as a fuel processor goes, we do recommend the Cobra Fi2000R fuel tuner since you would be changing the engine's fueling requirements. The fuel controller comes pre-set from Cobra to work with their full exhaust systems, so it's just a matter of putting it on and hitting the road. With that device and the new exhaust, you can expect better throttle response, more engine power with minimal fuss. Just install the pipe and the fuel controller and you'll be all set. Will these slash down pipes fit a 2006 stratoliner xv1900ct? Unfortunately, Cobra doesn't produce a set of Slashdowns to fit any Stratoliner models. The only two-into-two exhaust currently available from any supplier to fit that bike comes in the form of the Cobra Speedster Xtra Longs Exhaust System. Other than that, they're all two-into-one designs from Vance & Hines Stratoliner exhaust or Freedom Performance Yamaha Stratoliner exhaust designs. Do they come with exhaust manifold gaskets or would it be a good idea to purchase those as well? There are no exhaust manifold gaskets include with any exhaust made by Cobra. In many cases, you can re-use the OEM gaskets that are on your machine if they're in good condition. Still, it never hurts to have a proper set of replacement gaskets on hand so as not to hold up the installation. This is especially true if you have an older bike, or it has a lot of miles on it. If that's the case or you want to be absolutely prepared, we do have a range of aftermarket exhaust gaskets available for you to add to your order for peace of mind. I have a 2009 950 V star, what sounds better the speedster slashdowns or the Cobra dragster pipes? It really depends on what sound you're going for. If you want a loud bark, go for the Dragster pipes as they don't have much in the way of baffles and are a little shorter than the Slashdown pipes. The Slashdowns, due to their slightly longer design (especially for the front cylinder), have a bit of a smoother sound when compared to the Dragster. Both exhausts, however, are certainly louder than stock. It just depends on whether you want a raspy sound (Dragster) or a bit of a smoother sound (Slashdowns). The Cobra Speedster Slashdown Exhaust System has removable baffles installed. If you need to remove them simply remove the set screw that holds the end cap in place and the baffles are held in by the end cap and that set screw. Cobra uses 1-3/4" 16 gauge steel to produce their Harley Davidson exhaust systems. It will have a full length heat-shield with an outside diameter of 2-1/2"
Do I need a jet kit for my stock carburetor once i add the slash down pipes? To achieve the best power and performance out of the new exhaust system it would be highly recommended to rejet any time you change a full exhaust system on a carbureted motorcycle. You can find the corresponding jet kit in our store by searching "Cobra Carburetor Jet Kit" in the store search bar. Quiet baffles are sold separately. The Cobra number you need for the Speedsters is a 9015Q. If you give us a ring we can get them to you over the phone. We do not list them on our site at this time to ensure you get the correct baffles for your pipes. i have a 2003 honda vtx 1800c, do i absolutely need to have a fuel controller for this upgrade? Anytime the complete exhaust system is changed it is highly recommended to install a fuel tuner. You could always run it without and see how you feel it runs, normally they will run leaner and hot without a fuel tuner with a full exhaust install, especially if you already have a intake such as a high flow K&N or other performance type intake. Don you need to change or adjust anything if your bike is fuel injected? Any time you change a complete exhaust system from stock it is highly recommended to install a fuel tuner on a fuel injected motorcycle. The Cobra Fi2000R is the correct choice for the Kawasaki VN900 models. We have them listed in our store under the "Fuel Management Systems"